- Trim Size: 7.50" x 5.25" x 0.75"
NASB Pitt Minion Reference Edition: Brown, Goatskin Leather by Cambridge University Press was published by Cambridge University Press in February 2010 and is our 27793rd best seller. The ISBN for NASB Pitt Minion Reference Edition: Brown, Goatskin Leather is 9780521604116. Be the first to review NASB Pitt Minion Reference Edition: Brown, Goatskin Leather! Got a question? No problem! 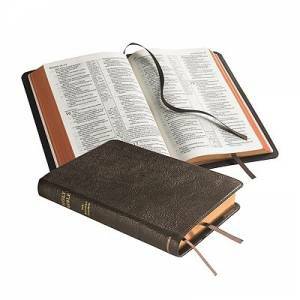 Just click here to ask us about NASB Pitt Minion Reference Edition: Brown, Goatskin Leather. The bible is very expensive and I want to make sure I can read the print and references.